This drill starts with players in right and left back, and is designed to simulate second and third contacts. To begin, a coach hits or tosses a ball at Player 1 who then plays the ball to Player 2. Player 2 passes the ball to an area marked by cones in the opposing side’s zone 1. The player who handled the third ball rotates out and the drill begins again. Variation: To modify the difficulty level, a coach can adjust the size of the landing zone or have players stand and hit down balls to zone 1 instead of pass. To set up, Player 1 starts in the middle front position with a coach on the opposite side. The coach lobs a ball just over the net to mimic an overpass. On the first ball, Player 1 goes up and attempts to hit a kill. On the second ball, the same player swipes the ball to the side of the block. The drill continues with the next player. Variation: Instead of telling players which type of shot to play, allow them to choose based on how the ball comes over the net. This free ball passing drill uses an inanimate object as a target that players must hit with the ball. It starts with a left and right back and a coach standing on the opposite of the net. The coach tosses free balls over and players attempt to pass to the target. The goal is to hit the target 10 times in a row. If a player misses or neglects to call the ball, the score goes back to zero. The player who passes rotates out and the next player takes her place. Variations: To amp up the difficulty, the coach can make the tosses more difficult. 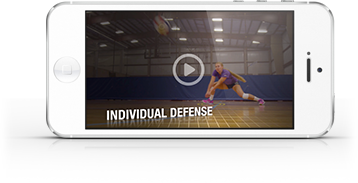 In this simple drill, two middle blockers and an opposing middle hitter set up on the court. The coach tosses an overpass ball toward the middle hitter who must redirect the ball to an open area of the court. In this passing drill, begin with a left and right back and a setter at the net. A coach stands on the opposite side and tosses free balls over. Passers send the ball to a point where the ball is in front of the setter's body. This makes it easier for her to set a “4” to the left outside hitter. The drill ends when the team passes 10 perfect passes using good communication. Additional topics covered in this video include serving, retreating on free balls, playing time, selecting a starting lineup, and bringing in guest coaches.